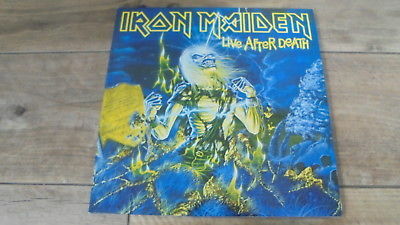 Iron Maiden - Live After Death. OriginalUK LP Issued in1985 byEMIRecords (RIP 1). First Pressing,A-1U/B-2U/A-1U/B-1U Matrix Numbers !! Complete with Printed Inner Sleeves !! Advance Promo Copy, Comes with a Press Release, Bio Sheets, 10" x 8" Photo and EMI Records Complimets Slip ! !